John Frusciante has confirmed that he has quit the Red Hot Chili Peppers. 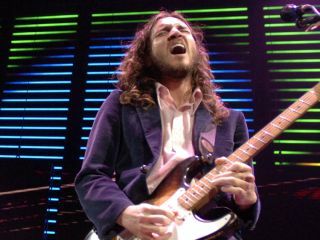 On Sunday (13 December), MusicRadar broke the news that the guitarist had split from the group, and now Frusciante has spoken out. "When I quit the band, over a year ago, we were on an indefinite hiatus," the guitarist writes on his blog on John Frusciante.com dated 16 December. "There was no drama or anger involved, and the other guys were very understanding. They are supportive of my doing whatever makes me happy and that goes both ways. "I really love the band and what we did," Frusciante continues. "I understand and value that my work with them means a lot to many people, but I have to follow my interests. For me, art has never been something done out of a sense of duty. It is something I do because it is really fun, exciting, and interesting. "Over the last 12 years, I have changed, as a person and artist, to such a degree that to do further work along the lines I did with the band would be to go against my own nature. There was no choice involved in this decision. I simply have to be what I am, and have to do what I must do. "Sending love and gratitude to you all." While the Red Hot Chili Peppers have yet to issue any kind of official statement, the question now remains: Is Josh Klinghoffer, with whom the band has been working, slated to become a permanent member? The group is scheduled to perform at the 2010 MusicCares Person Of the Year tribute to Neil Young on 29 January in Los Angeles. Perhaps this will be Klinghoffer's coming-out party.